Joe Ongie Interview: "I just need to drop myself from my own label"
John Ongie is not only a very talented singer songwriter he is also funny. In the interview he talks about the current menu at his Gypsy Den Cafe in Orange County, The Beatles (not again), his last words, getting lazy and off course his brilliant new album Critical darling. But please, don't take everything too serious. E.C. : Critical darling doesn't still sound like Revolution by the Beatles, your favourite album of all time. What went wrong this time? Joe Ongie: I think you mean Revolver (although I like the song "Revolution" a whole lot too) - it's funny, but I've been playing in a Beatles cover band lately, doing charity shows and it's had the sad effect of making me sick of all those songs. Bummer! I suppose the fact that the album doesn't sound like Revolver actually means I did something right, not something wrong - which is I'm making music that sounds like me. Generally I use the Beatles (or Rogers and Hart or Led Zeppelin or Joni Mitchell or Elvis Costello or the Stones, etc.) as the ideal of which I try to measure my music against. Not to copy them, but to aspire to the level that those artists (and many others) have achieved. Wow, that sounded mighty pretentious. E.C. 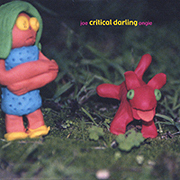 : Critical darling reminds me on Tom Petty, Matthew Sweet, Michael Penn and even some Jon Brion. That is a) good, but b) a contradiction, because you once said mean things about Brion (Note of the guy, who wrote this: in my last interview with Joe)!! What is your self defence? Joe Ongie: Did I really say mean things about Jon? I'm sure I was just jealous of how stinking talented he is. I've seen him play many times over the years and he's always amazing. I only wish he would get around to making a second solo album. I had a chance last summer to play with Matthew Sweet and it was a big thrill since I'm a huge fan of his (particularly Girlfriend and 100% Fun. E.C. : Is a "Critical darling" something you would like to be? Joe Ongie: Well, that's kind of the joke of it: It seems that all of the songwriters that I love have all been dropped by their labels (Sam Phillips, Aimee Mann, Lloyd Cole, Ron Sexsmith and many more) and are consistently ignored by popular radio. Yet they consistently get raves from the press and complete apathy from the record buying public. With that as the criteria, I think I may already be a "Critical Darling" (I just need to drop myself from my own label). E.C. : One song is called "Famous last words". What would your last words be? E.C. : Are you gettin commercial? Your new album comes not in a handmade cover like the last one Lovefest. Joe Ongie: Not commercial, just lazy. Actually, it just became too time consuming to do all of the hand-made covers, and if you buy Lovefest now it comes in a printed cover. My friends Shelly Frasier did the photos and clay figures for Critical Darling and I love them. Don't you? E.C. : If you could go on a worldtour, where wouldn't you go? Joe Ongie: There's nowhere I wouldn't go. I love to travel, although I hate to fly (I'm too tall). The travelling I've done in the past has been the best education I've ever received. And I love to play live, so anyone that would have me is welcome to me. Although I keep missing Switzerland (Note of the guy, who wrote this: I asked him some time ago if he would play at my living room. Unfortunately, he didn't have time to come to Switzerland)! E.C. : On the new album it is definitely not possible to compare you with The Eels. Were you so fed up with this comparison that you decided to release an album that doesn't sound like them at all? Joe Ongie: I have never even owned an Eels record. Maybe I should get one so I can hear what I don't sound like. I'm sure just like any of the other people I sound a little bit like, the Eels probably had similar influences as I had growing up and so there's a common thread running through the music. If I listened to blues as a kid, I would write music that reflected that. E.C. : What punishment do you have for the next guy who asks you something about the Eels? Joe Ongie: A big sloppy kiss. E.C. : Critical darling has a lot of different moods. How conscious was that? Joe Ongie: The CD originally began as two separate albums - one with "rockers", the other with ballads. Sometimes I think I'm too schizophrenic and so I thought I'd try to concentrate on two distinct moods. But, of course that dreaded laziness thing came back and after two years of work on 20-plus songs, I just threw some tracks out, put the rest of them together and made this record - schizophrenic to the end! Actually, I love records that go all over the place (The White Album, Imperial Bedroom), so I'm glad to keep up that tradition. Also I've set Critical Darling up to have a side one and a side two, so that if start it at song nine you get nice flow of songs all by themselves. Just like a good old-fashioned vinyl lp. E.C. : What inspired you to write the song "Beautiful accident"? Joe Ongie: I know a guy who's in a major rock band and he's just had all the breaks - he just seems to fall into it without really trying. Just a natural rock star when you get down to it. So the song is a little bit about him as well as some other good-natured drunks I've know over the years, the ones who wrap their cars around signposts and just walk away from the wreckage without a scratch. E.C. : If you would think in terms of hit singles, which song would be the single? Joe Ongie: "Sleepwalking World" seems to be the song that most people comment on. It seems to strike some sort of nerve - maybe because it's so simple. "Danny Flowers" is pretty straight forward too, and would be a good candidate. In a perfect pop world, where The Monkees ruled, "Better Than This" or "Sad Ever After" would shoot of the top of the simian hit parade. E.C. : What would be your musical nightmare? Joe Ongie: I'm living it. E.C. : Who should buy your album and who should not? Joe Ongie: Of course, every one should buy it, but if they don't like groovy mind bending music of extraordinary genius, they should just leave it in the wrapper. E.C. : What is definitely not true about your new album? Joe Ongie: It's a million-seller. E.C. : What is the worst thing about playing live? E.C. : What is the current menu at your Gypsy Den Cafe in Orange County? Joe Ongie: Too much to say, you need to come in and look at the menu yourself and I'll buy you a beer over a bowl of veggie chilli and piece of cornbread.